EcoShield™ is an all-natural, non-chemical antimicrobial preparation for controlling the foodborne bacterial pathogen Escherichia coli O157:H7. 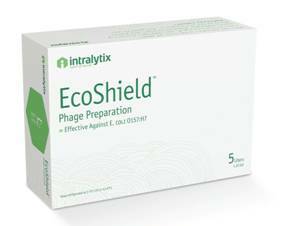 The active ingredients of EcoShield™ are naturally occurring lytic bacteriophages that selectively and specifically kill E. coli O157:H7. EcoShield™ is specifically designed for treating foods that are at high risk for E. coli O157:H7 contamination. Is FDA-cleared, through a "Food Contact Notification" or FCN, for use on red meat parts and trim intended to be ground (FCN No. 1018). Is FSIS-listed as safe and suitable for use in the production of red meat parts and trim prior to grinding as processing aid with no labeling requirements (FSIS Directive 7120.1). Is Health Canada approved for use on red meat parts and trim prior to grinding (iLONO). Is National Food Service of Israel approved as food processing aid for the treatment of meat immediately before grinding (Ref: 70275202). Requires no labeling ("clean label"). Is cost effective and cost competitive. Is effective under a wide range of food storage conditions (e.g. 2°C-42°C). Is all natural and not genetically modified (non-GM). Does not alter food flavor, aroma, or nutritional value.